Gary Alexis Medel Soto (born 3 August 1987) is a Chilean football player who plays as a defensive midfielder for Boca Juniors in Argentina. One of the new wave of young Chilean talent, he is a favorite of national coach Marcelo Bielsa, who has used him both as ball-winner in midfield or in a back-three. As indicated by his nickname of 'Pitbull', the stocky powerhouse is a fiery competitor, but also boasts a good range of passing and jumps incredibly high for headers. In essence, he has the raw materials to offer so much to this Chile side and now comes his chance to prove he can deliver the goods when it matters most. However, trouble has tended to follow him off the pitch as he was caught driving under the influence of alcohol and has also been caught up in some unfortunate nightclub incidents. His bad-boy reputation will need to be banished if he is to shine for his country in the future. Medel came up in the Universidad Católica youth system and made his professional debut in 2006. He was also a key player in Chile's successful U-20 side that captured 3d place at the U-20 World Cup in Canada, where he began to catch the attention of scouts, despite the fact that he left his team with 10 players in a very unnecessary play in semi-final match against Argentina, alongside other standout players such as Arturo Vidal, Alexis Sánchez, and Mauricio Isla. He scored his first goal on the 28 July 2007 and won the hearts of Católica followers after a game against eternal rivals Universidad de Chile in which Medel scored both of his teams goals and sealed the victory. He has suffered from a series of issues (including a suspension for spitting at an opposing player a serious car accident, and the unfortunate death of a young woman who fell out of his balcony during a party among others) have interfered with his career. In 2008 Medel was awarded the Player of the Year award by the Chilean press (ahead of Argentine striker Lucas Barrios) and managed to earn a regular spot in Marcelo Bielsa's starting 11 for the national team. On 20 July 2009 it was confirmed that Universidad Católica and Boca Juniors agreed on a loan deal for the player. Medel was officially presented three days later. On 25 March 2010, Medel scored two goals to defeat their rivals, River Plate, with a 2-0 win in which Medel was later sent off. Under coach Jose Sulantay, Gary Medel was a key player in Chile's U20 team that captured third place at the U20 World Cup in Canada. Medel also participated for Chile's U-23 side at the Toulon Tournament of 2008, where he was part of the team which lost 1-0 in the final game against Italy. After this Marcelo Bielsa began calling on him for full international duty. He had his international debut with Nelson Acosta in year 2007, in Mendoza, in a friendly against Argentina, which ended 0-0. Despite being nominated in various occasions prior, Medel made his World Cup Qualifying debut against Bolivia in difficult La Paz in the fifth game of the tournament, where he not only shone as a right defender (backline of three) but also scored both goals to give Chile an important 2-0 victory. The first goal was a 'chilena', or overhead bicycle kick. He has started every national team game that he has been healthy for since, usually being chosen as a right defender over such alternatives as Arturo Vidal (Bayer Leverkusen) and Mauricio Isla (Udinese). He played in the 1-0 victory against Argentina in a 2010 World Cup qualifier, where he received a standing ovation upon his substitution. 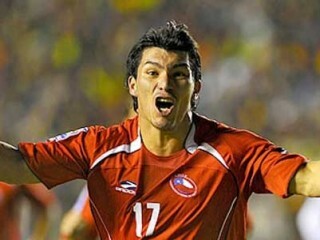 View the full website biography of Gary Medel.